Inicio/Democracia y Política/Democracia/The Economist: What would the FDP do? The Economist: What would the FDP do? THERE is a decent chance that the pro-business Free Democrats will join the next German government under Angela Merkel’s Christian Democrats (CDU), either as her sole coalition partner or alongside the Greens in a so-called «Jamaica» formation (black-yellow-green, like the flag). It would be a remarkable comeback for a party that crashed out of the Bundestag in 2013; a revival that I explain in this week’s issue. But what would that mean, for Germany and the world? Last week I sat down with Christian Lindner, the party’s leader, for a wide-ranging discussion about Germany, its domestic and foreign policies and the FDP itself. The full transcript is here. We met in the shadow of Cologne Cathedral, in his home state of North-Rhine Westphalia. It was our second recent meeting. Earlier I had joined him on the campaign trail in Frankfurt, where he brought a crowd of students to its feet with a spirited paean to liberalism. Where does Mr Lindner stand, really? Founded shortly after the war by old liberals from the pre-Nazi era, the FDP has several intellectual tendencies: social liberal, classic liberal, free-market conservative. The balance between them has shifted throughout the party’s history; partly in line with its coalitions. It has governed most often with Christian Democrats like Konrad Adenauer, Helmut Kohl and Mrs Merkel, but also with SPD leaders like Willy Brandt and, currently, Malu Dreyer, the state minister-president of the Rhineland-Palatinate. Mr Lindner melds these trends. On Europe and migration, he is less liberal than Mrs Merkel. On the economy and society he is more so. Like it or not, it is a balance that well suits a party of ageing suburbanites and younger, well-off professionals; a party of the golf course and the cocktail bar. Mr Lindner’s answers were crisp, fluent and peppered with hyphenated Anglicisms: «cutting-edge», «pro-market», «B-to-B». In style (confident, slick, youthful) and in political tilt (economically liberal, politically reformist and somewhat populist) he reminded me of Sebastian Kurz, the centre-right politician who will probably become Austrian chancellor in October. Like Mr Kurz, he picks his words carefully. The FDP may end up as the largest opposition party in the Bundestag in the event of a new grand coalition. If, alternatively, it joins the government it may well hold the German foreign ministry and a few other departments (as well as the vice chancellorship). How effectively it would assert its politics is unclear. Some point to its absence of experienced ministers in the FDP ranks. 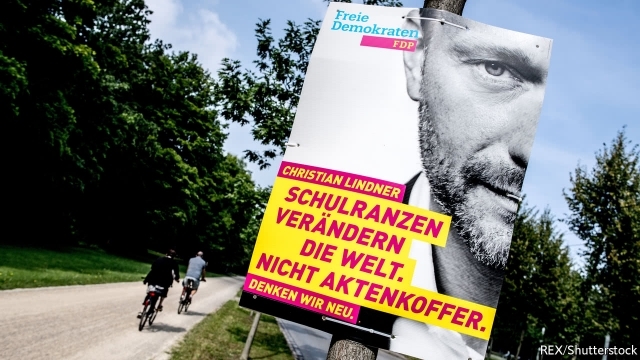 But failing to make the party’s influence felt in its last coalition with Mrs Merkel led to its electoral disaster in 2013, Mr Lindner notes with furrowed brow, pledging not to make the same mistake again. His views probably matter.